Since the devastation of October 2012’s Hurricane Sandy, enumerable concerned organizations, committees, and individuals of NYC have been toiling furiously towards a common goal. The future of New York City’s waterfront urban design is a topic of both heated debate and intricate planning – not surprisingly, as the end result promises to be one of the largest and (however necessary and well-intentioned) most disruptive urban interventions in NYC’s recent history. Over the past 2+ years, I’ve done what I could to stay informed of large developments in the process as it inches ever closer to reality. By the summer of 2013, the US Department of Housing and Urban Development (HUD) and the newly-minted Presidential Hurricane Sandy Rebuilding Task Force had collaborated to form Rebuild by Design. 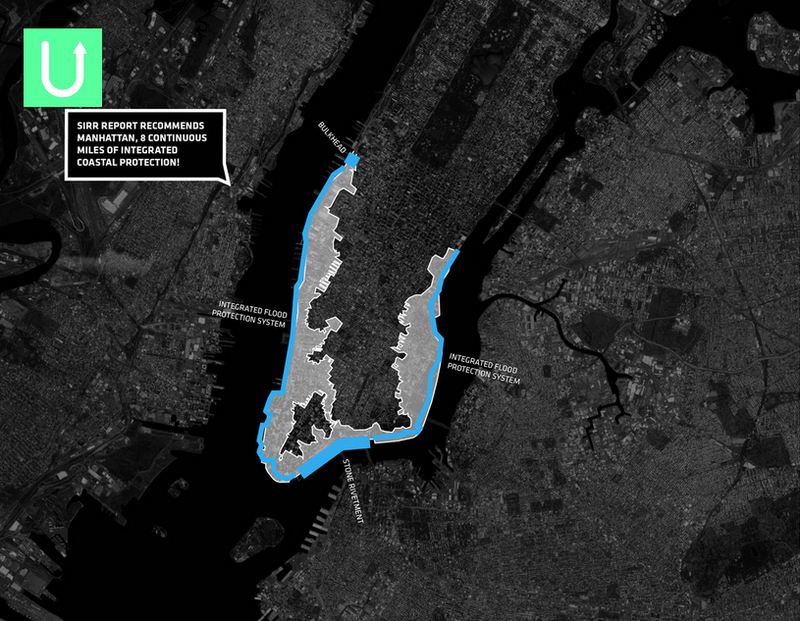 This task force hosted a multi-stage design competition to reimagine NYC’s waterfront to be more resilient against the inevitable higher water levels and more impactful storms. Out of 148 international applicants, 10 were selected and showcased to the public. In June 2014, the HUD jury announced the 6 winning proposals and allocated $335 million to implementing part of one of the 6 designs: a portion of “the Big U,” a design submitted by the BIG (Bjarke Ingels Group) team. BIG’s originally proposed scope is quite extensive, forming a large “U” shape (for which the project is undoubtedly named) enveloping lower Manhattan, and envisioning a comprehensive range of urban programming combined with complex flood-preventive engineering. The proposal is as daunting as it is exciting – so the city is moving forward by taking small bites. First on the fork: the slice of southeastern Manhattan between Montgomery Street and 23rd street. On Thursday night, March 19th, I attended one of two Community Engagement Sessions for this massive urban design undertaking; dubbed the East Side Coastal Resiliency Project. 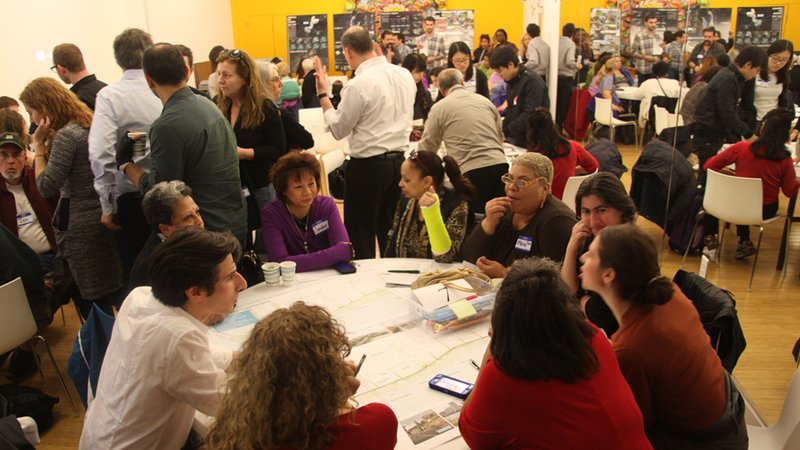 Presented by the NYC Mayor’s Office of Recovery and Resiliency along with the BIG team and LESReady!, the meetings are intended to involve the local neighborhoods in the development of a design that will directly affect them. Thursday night’s meeting took place in Bard High School, nestled within the large NYCHA development that spans from below the aforementioned Montgomery Street up to East 13th Street. In hopes of learning more about this area from the community that knows it best, the Mayor’s Office of Recovery and Resiliency, the Department of Design & Construction, the Parks Department, and the BIG team set up a handful of large site maps and handed out sheets of colorful stickers. Participants grouped together in front of the maps, discussing the different areas and quality of spaces, and applied the stickers that corresponded with their experiences: I love this area, My favorite waterfront view, I don’t go here, Noisy, etc. We were also handed maps and asked to sketch in our most frequent circulation routes. Meanwhile, members of the Parks department, the mayor’s office, the BIG team, the landscape design team (Starr Whitehouse) and name-tag-sporting members of seemingly a dozen other groups milled about and engaged residents in discussion. 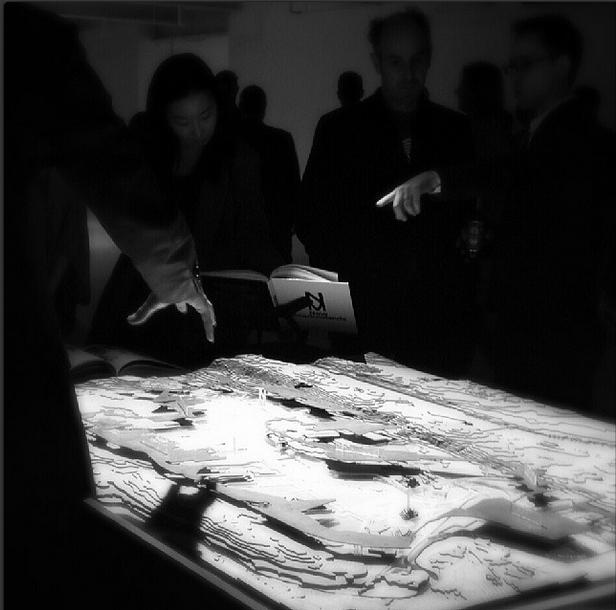 An explanation of the project’s history and current status followed, introduced by Daniel A. Zarrilli of the NYC Mayor’s Office of Recovery and Resiliency and presented by Jeremy Seigel, BIG project designer and a project director of the Rebuild by Design team. Seigel explained the three types of intervention the team proposes to employ on a very basic level: the berm, the fixed wall, and the deployable wall. He showed precedents of the aforementioned techniques from Amsterdam, Germany, and the UK, and emphasized that the design for NYC is currently very much liquid (so to speak). For now, essentially, the team is doing their homework. They are investigating below ground conditions and site drainage, surveying the land, sending divers under the East River to assess the waterfront structures, and inspecting bridges. The team is also analyzing the effect that a measure such as this will have on the surrounding neighborhoods – to ensure that protecting one area does not have adverse effects on another. It’s a laborious and complex process, for which Rebuild by Design has slated 9 months of research and design development. Mr. Zarrilli responded in agreement and assured us all that the Mayor’s office et al. are doing all that they can to publicize the meetings. As the coming months progress, residents, officials, and designers would undeniably benefit from collaborating with one another as much as possible. Hopefully, the rumblings concerning the plans for this sliver of Manhattan will grow as the construction date moves closer. It will be an exciting first step towards the necessary evolution of our dear city, and the design will be all the richer if the teams are successful in their goal of community involvement.